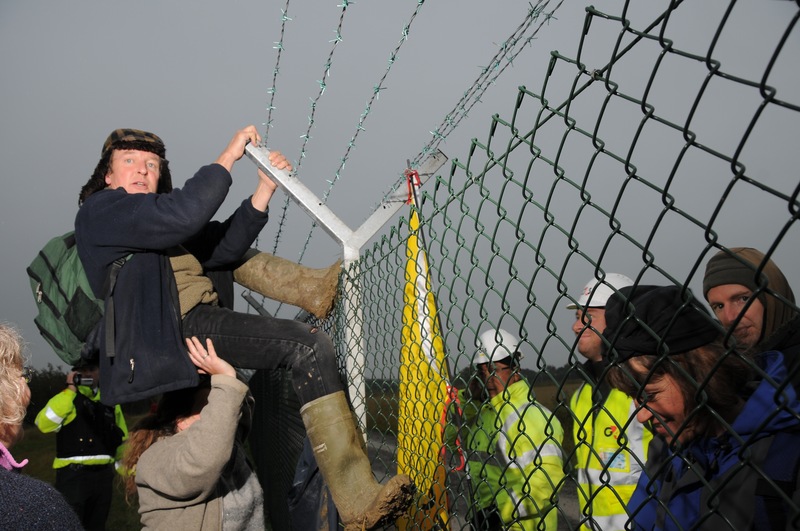 On October 8, six protesters were arrested during a mass trespass at the Hinkley Point nuclear power station in Somerset, England. Around 30 people went over the perimeter fence of the land earmarked for two new EPR mega-reactors next to the existing power plant just after dawn. Three people attached themselves to the fence with bicycle locks. More than 20 others gathered outside the main gate. Dozens fanned out around the 5-mile long fence while others held banners and placards outside the main security gate. A 14-foot banner reading, “Nuclear disaster zone. Boycott EDF” was hung across the gate. At 11 a.m., a total of 577 seed balls were thrown over the fence onto the construction area in a symbolic attempt to repair the damage already caused to the land. The seed balls represent the number of days since the Fukushima nuclear disaster in Japan. 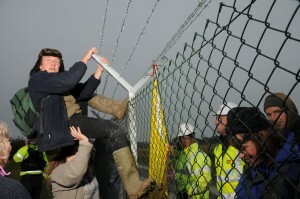 Photographs of the trespass are available at the Stop New Nuclear website: stopnewnuclear.org.uk/reclaimhinkley/photos.